Mahindra and Mahindra has launched the facelifted version of its popular SUV model with a few changes to its interiors and exteriors. 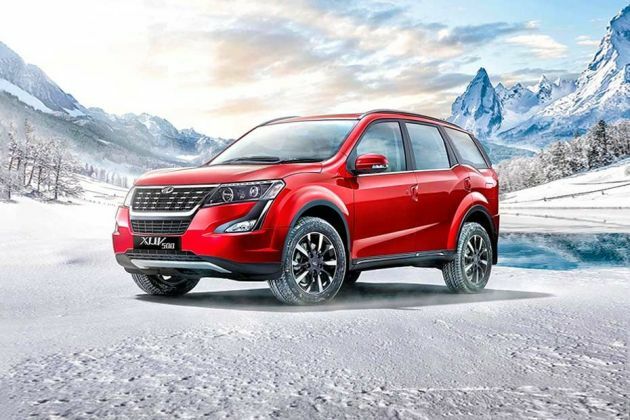 Its mid range trim is named as Mahindra XUV 500 W8 2WD , which has a bold yet impressive external appearance. Its radiator grille in the front has now chrome inserts, while the bright fog lamps come with chrome bezel. Its wheel arches are equipped with a new set of alloy wheels, whereas the chrome appliqué on boot lid gives a remarkable look to its rear end. The internal section too has some changes like a dual tone dashboard that has some equipments fitted to it, and the new icy blue lounge lighting is also offered. Other aspects in the cabin include a tilt steering system, reading lamps, twin pod instrument cluster as well as second and third row foldable seats. In terms of comfort, it has an advanced infotainment system with a 7-inch touchscreen display screen. Meanwhile, the Mahindra BLUESENSE app, voice recognition system, eight way manually adjustable driver's seat, power windows, and conversation mirror are the other interesting aspects in this variant. Safety is best guaranteed by this vehicle through its various significant aspects. Some of these include disc brakes, side impact beams, rear demister, door ajar lamps, as well as ABS with EBD. On the other hand, it is incorporated with a 2.2-litre diesel power plant that is paired with a 6-speed manual transmission gear box. Its acceleration and pickup is quite good, whereas the power and torque output is also decent. This sports utility vehicle comes with some remarkable exterior aspects that makes it stand out among others in the market. Its windscreen in the front is pretty large and integrated with a pair of rain sensing wipers. The chrome inserts on its radiator grille gives it a stylish appeal. This grille is large, perforated and includes company's insignia as well. It is flanked by a well designed headlight cluster that is integrated with high intensity projector headlamps with light guides. Then, there is a wide air dam fitted to its body colored bumper, which also includes a couple of fog lamps with chrome bezel. On the sides, it has adjustable outside rear view mirrors, door handles and pronounced wheel arches. These are equipped with a modish set of 17 inch alloy wheels, which are further covered with P235/65 R7 sized tubeless tyres. Meanwhile, its rear end looks just stunning with a chrome monogram on the tailgate, which is further complimented by the firm's logo. The windshield has a wiper and defogger, whereas the bright tail light cluster comes integrated with turn indicators. All in all, with such impressive features, this vehicle certainly draws a lot of customers' attention. This mid range variant is blessed with a plush internal section that is decorated with a two tone color scheme. The dashboard features a twin pod instrument cluster, and its steering wheel is wrapped with fine leather. The seats inside provide excellent comfort and these are covered with premium leather upholstery. The driver's seat can be manually adjusted in eight different ways, whereas the second and third row seats have split folding facility. The icy blue lounge lighting, chrome inserts as well as scuff plates altogether further adds classiness to its interiors. It comes with a high volume glove box compartment that also includes a laptop holder. Besides these, aspects like conversation mirror, reading lamps, assist grips and a few other storage spaces are also offered. The automaker has incorporated this muscular SUV with a 2.2-litre, mHawk diesel engine that has the ability to displace 2179cc. It carries four cylinders, sixteen valves and is integrated with a common rail fuel supply system. This motor features the fifth generation variable geometry turbocharger and couple with a six speed manual transmission gear box. It churns out a peak power of 140bhp at 3750rpm and delivers 330Nm torque output between 1600 and 2800rpm. The maximum mileage returned by this mill comes to around 16 Kmpl and enables the vehicle to reach a top speed of nearly 190 Kmph. It is bestowed with a proficient independent suspension system that keeps the vehicle stable at all times. On the front axle, a McPherson strut has been assembled, whereas the rear one is affixed with a multi link type of system. Both these axles are further loaded with anti roll bars. In terms of braking, all its four wheels are fitted with a robust set of disc brakes that includes calipers as well. This mechanism is further assisted by anti lock braking system along with electronic brake force distribution. Apart from this, it comes with a power assisted steering system that makes its handling quite convenient to the driver. Its tilt as well as telescopic adjustment functions further adds to its advantage. A good number of comfort features are offered in this variant, which assures an enjoyable driving experience to its occupants. To begin with the music system, it comes with a 7-inch touchscreen display screen. It also includes GPS navigation, USB connectivity, and picture viewer as well. Moreover, the Mahindra BLUE SENSE app allows to connect with the vehicle by way of Bluetooth technology and lets one to control aspects relating to climate control and audio unit. There are also two tweeters and four high quality speakers offered. It has power windows with express down function on the driver's side. In addition to these, aspects like remote tail gate opening, cruise control, mobile charging points in all three rows, puddle lamps, tinted solar reflecting glass and a few others further increase the level of convenience. There is a long list of safety features available in this trim that guarantees protection of its passengers and the vehicle as well. Some of these include airbags for driver and co-passenger, side and curtain airbags, hill hold and descent control, anti lock braking system with electronic brake force distribution. Besides these, it also has side impact beams, engine immobilizer, electronic stability program with rollover mitigation and crumple zones for crash protection, which adds to the safety quotient. 1. Enough leg and shoulder space is offered. 2. Excellent external design and appearance. 1. Mileage needs to improve. 2. A few more styling features can be added. Mahindra XUV500 W8 2WD Comfort & Convenience"Push-button start/stop /n Voice Messaging System /n Voice Commands with Voice Recognition & SMS Read Out /n Mahindra BLUE SENSE App /n Micro Hybrid Technology /n Tyre-tronics /n Electronic Steering Lock /n Fully Automatic Temperature Control (FATC) /n Cruise, audio, phone & voice commands on Steering /n Power Windows /n Driver Express-down window /n Remote Tailgate Opening /n One Touch Lane Change Indicator /n Reading Lamps /n Conversation Mirror /n Mobile Charging Points /n Puddle Lamps /n Entry Assist Lamp /n Flexi seat configuration for convenient storage (60:40 foldable 2nd row, 50:50 3rd Row) /n Flat-foldable 2nd and 3rd row seats /n "